Kaitlynn Samborsky and Joe Greathouse putting concrete nest boxes, created by our partners in the Sustainable Prison Program, in a stream in West Virginia. Photo by Grace Winzeler. Eastern hellbenders have been in decline across many regions of the eastern United States. 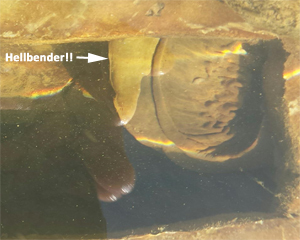 The Midwest has shown some of the most significant declines in hellbender populations. 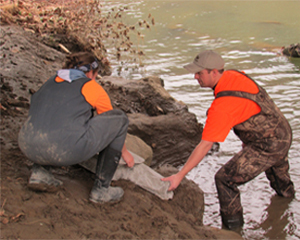 Current conservation efforts in West Virginia and Ohio include eDNA surveys, establishing habitat corridors and captive rearing and release programs. Hellbender in concrete nest box. In this podcast, our guest host, Dr. Steve Kimble, will be interviewing Joe Greathouse about how variability in water temperatures may influence the foraging ecology in these giant salamanders. Joe is the director of conservation science at The Wilds in Ohio.